In November 2015, Nuclear War Now! announced its resumed alliance with the legendary Demoncy, with whom the label had first worked to reissue is seminal third album, “Joined in Darkness,” in 2011. Since that time, NWN! has reintroduced its audience to the band’s debut full-length with its CD reissue of “Faustian Dawn” in August 2016. Proudly, with the label’s first CD release of 2017, Nuclear War Now! completes the unearthing of Demoncy’s original evil trinity with this presentation of the band’s second opus, “Within the Sylvan Realms of Frost.” This second conjuration summons a stark, otherworldly landscape, in which all who enter slowly but ultimately succumb to an unenviable demise by frozen-air asphyxiation. Although this album does not deviate fundamentally from the approach adopted by the band on its previous album and intervening demos, there are some subtle but notable differences which serve to distinguish it. Some of these differences are at least partially attributable to a significant change in lineup from the first album. Still present, of course, is diabolical mastermind Ixithra, who remains the one enduring member. This constant notwithstanding, Ixithra is joined on “Within…” by an otherwise relatively new supporting cast with whom he first conspired in the recording of the immediately preceding demo, “Commencement of the Dark Crusades.” Whereas the vocals on “Faustian Dawn” were often multi-layered and predominately whispered, the vocals on “Within…” are less textured and more caustically abrasive, a feature that owes itself to the newer vocalist, Synvorlath. In addition, the guitar tones/distortion chosen by the more recently enlisted guitarist, Elsifer, and Ixithra himself carry less depth than on the first album and instead cut with a much sharper, more precise edge. In fact, the overall production of “Within…” is thinner than its predecessor, which lends it a palpably distant coldness that is further accentuated by the haunting harmonies provided by Ixithra’s keyboard work. 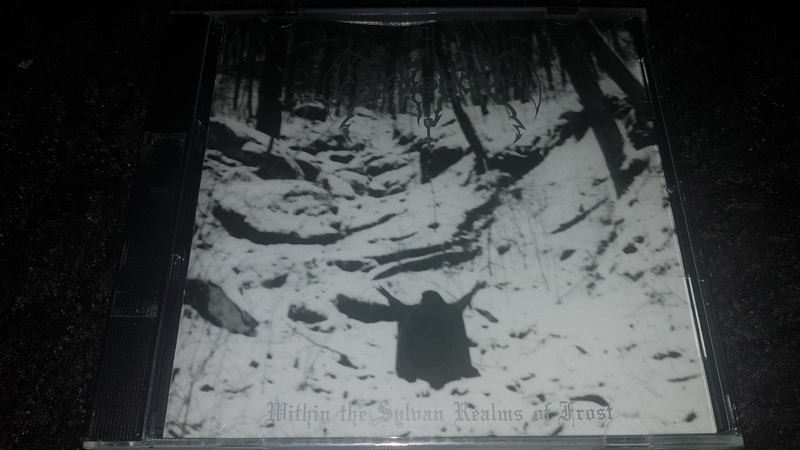 As a result, “Within the Sylvan Realms of Frost” exudes a frozen aura that is worthy of its title and thus serves as the second chapter in a tome written by one of the most innovative originators of black metal to have defiled the North American continent.